Left lane must turn left. Regulation signs regulate traffic speed and movement, displaying rules which drivers must obey. 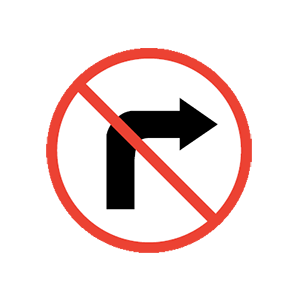 This regulation sign means that right turns are prohibited. Take your foot of the gas. Do not immediately use your brakes. Gradually slow down and pull off the side of the road. If you experience a tire blowout, take your foot off the gas pedal and do not immediately apply the brakes. Gradually slow down before gently applying the brakes and pulling off the side of the road. May be moving or stationary. Is marked with black and white signs. Does not require a driver to slow down and pay extra attention. Work zones are often stationary, but they may also be present in the form of moving vehicles striping lines, mowing, or removing snow. Work zones are marked by orange signs with black lettering or symbols. Slow down and pay extra attention when approaching or driving through a work zone. Turn right after making a complete stop. Right turns are not permitted. 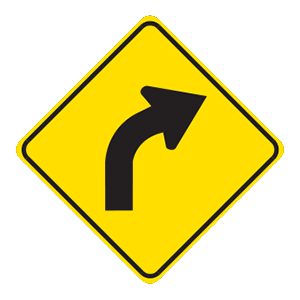 Regulatory signs display laws that drivers must always obey. 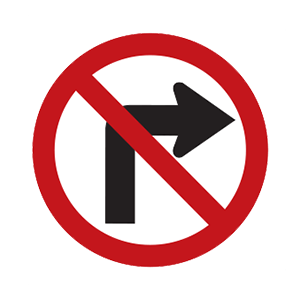 Right turns are not permitted where this sign is present. Drive cautiously and reduce your speed. Not use your high beam headlights. Use low beam headlights to better illuminate the road and objects. Fog can greatly reduce your ability to see other vehicles, pedestrians, and traffic signals. When driving in fog, drive cautiously and at reduced speeds. Do not use high beam headlights. Low beams better illuminate the road and objects ahead in foggy conditions.